The Polish wintertime may sometimes be harsh but it never fails to be strikingly beautiful. Here you can behold its stark glory through seven late 19th-century paintings created in the realist style by masters like Julian Fałat and Józef Chełmoński, along with some info about these iconic pieces and their authors. Julian Fałat is widely considered, and rightfully so, one of Poland’s leading landscape painters. However, this particular painting, an oil one, isn’t of the kind that’s typically associated with him – he’s usually best remembered for his early 20th-century watercolours, impressionistic in character and inspired by Japanese art. 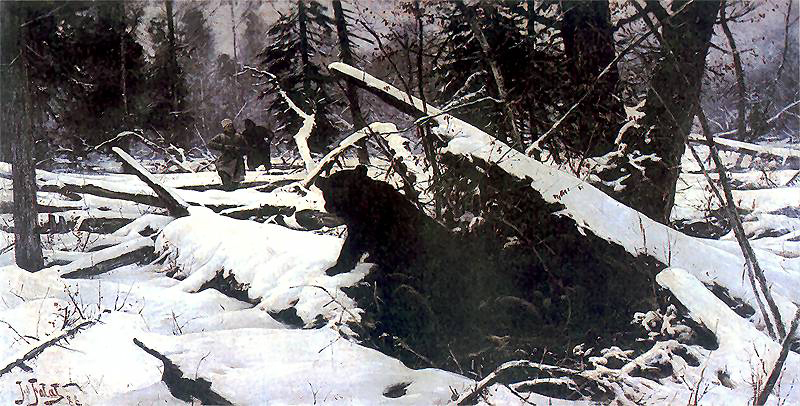 Still, Bear Hunt, a testimony to his earlier fascination with realism, is a splendid composition, highly evocative of the spirit of wintertime. It shows a hunt in Nieśwież, an aristocratic estate whose (former) area lies in today’s Belarus. Even though Nieśwież lies abroad, the nature shown in the painting is something you could easily encounter in Poland in its eastern parts. Alfred Wierusz-Kowalski, 'Kraków Wedding', 1876-78, oil on canvas, in private collection. This piece’s author, Alfred Wierusz-Kowalski, was born in Suwałki, a town often referred to as Poland’s pole of cold because of its icy climate. 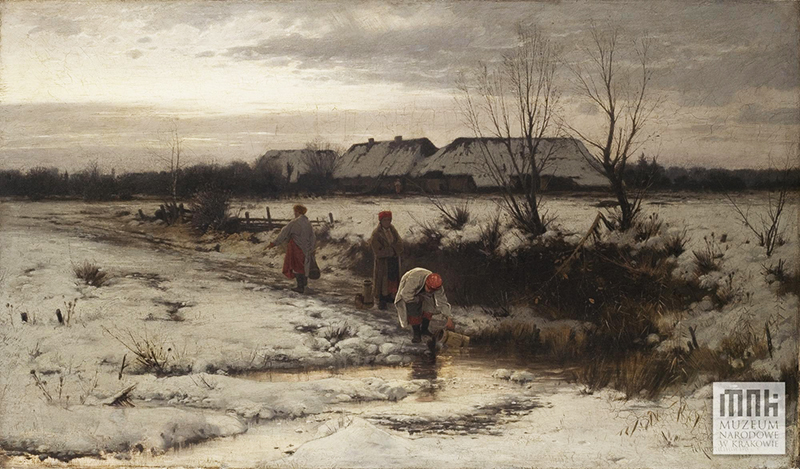 The harsh winters of his childhood which he spent in the Suwałki area may have played a part in him later becoming a painter especially valued for his winter scenes. His depictions of snow are said to be second to none, but he was also superb at showing horses and had a great eye for details, e.g. clothing. Keen on creating scenes with processions and horse wagons, the artist included his favourite things in Kraków Wedding as well as ones he painted best, which explains why this cheerful work has so much appeal. After living in Paris for over a decade, where his genre paintings were highly appreciated both by critics and audiences, Józef Chełmoński came back to his homeland of Poland in 1887. While he had left in search of success, he returned to focus on painting landscapes. 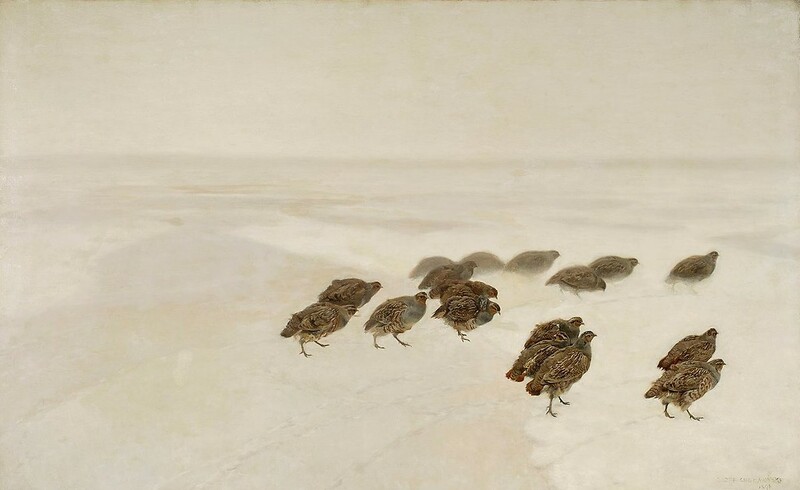 Some say that Partridges, one of Chełmoński’s most famous pieces created after 1887, expresses his pantheistic beliefs, while others argue that it’s an allegory about the Polish nation, whose country was partitioned throughout the 19th century. Whatever may be the case, the cold flock in the endless white masterfully conveys the stark beauty of Poland’s coldest months. 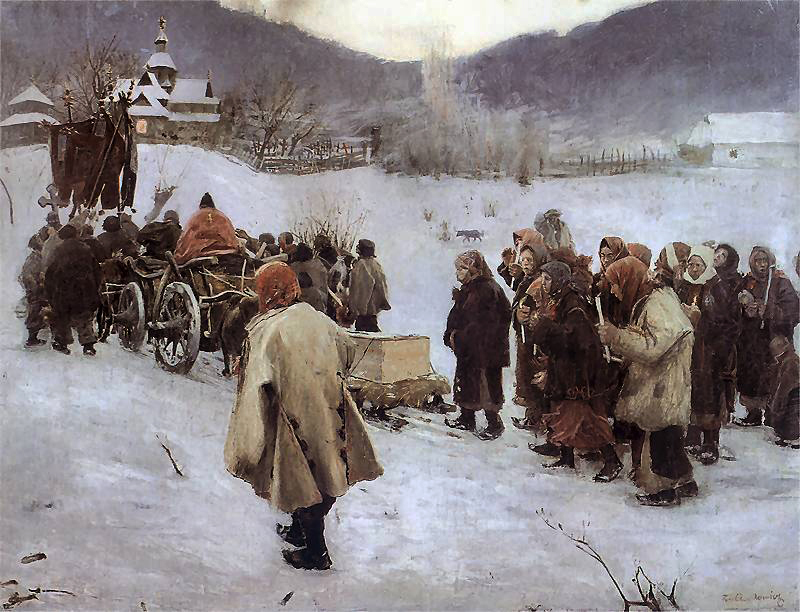 Teodor Axentowicz, 'Hutsul Funeral', 1882, oil on canvas. 86 x 115 cm, in private collection. Another view from an area that once belonged to Poland but is now part of a different country. In this painting by Teodor Axentowicz, you can see the Hutsul region in the Carpathian mountains of today’s south-western Ukraine. The region and the highlanders inhabiting it, an ethnic group known as the Hutsuls, were shown in many a canvas by the artist due to his strong interest in local customs, religious rituals and clothing. In Axentowicz’s depictions of the Hutsuls you can often see majestic, snow-covered mountain views that bring to mind the Carpathian hills that lie in the south of today’s Poland. 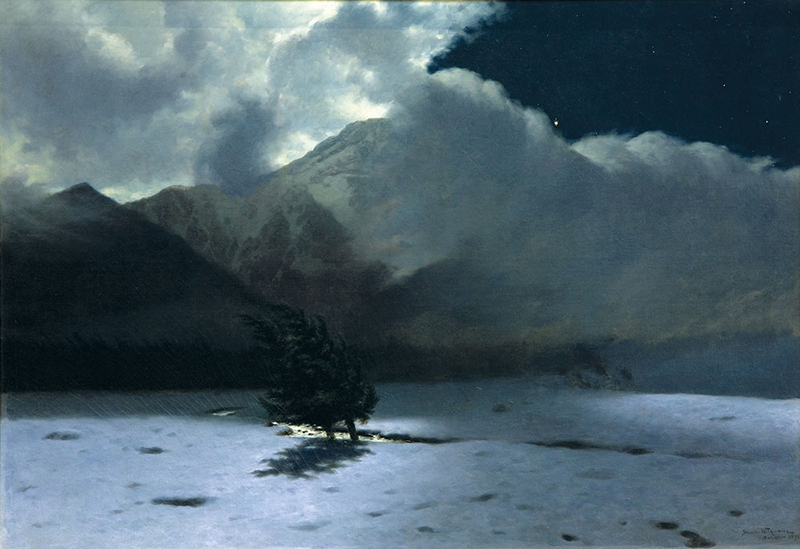 Stanisław Witkiewicz, 'Halny Wind', 1895, oil on canvas. 93 x 132 cm, photo: National Museum, Kraków. ‘Halny’ is the name of a kind of incredibly strong wind that blows periodically through Poland’s Tatra Mountains. In this scene, you can see the effect it has on a lonely pair of trees. The canvas was made by Stanisław Witkiewicz who for many years lived at the foothills of this range, in the picturesque town of Zakopane where he led a Bohemian life and developed a taste for highlander culture. Apart from being active as a painter, the diversely-talented Witkiewicz was also a writer and architectural designer. In one of his short stories, Witkiewicz, who believed that portrayals of nature should involve showing the inner state of the artist, wrote a passage considered a comment to Halny Wind, where he mentions a pair of spruces ‘tussling in desperate powerlessness’. Here you can see what is most probably a view of the countryside near Kraków. Such places, usually boggy ones lying in the vicinity of the Vistula river, were often painted by the painter behind Winter Landscape, Roman Kochanowski. This particular piece is a great example of his ability to convey the occasional dampness of the winter climate and of his masterful use of colours, both things for which he’s highly valued. Despite the overall melancholy of this scene, which features a rather humble settlement on a cloudy day, it captures the Polish wintertime in a manner that’s both compelling and visually attractive. Aleksander Gierymski is one of Poland’s most prominent realist painters. He’s often remembered for the play of light and colour captured with unparalleled skill in many of his canvases, as well as for a series of works showing the poorest neighbourhoods of 19th-century Warsaw. Saxon Garden, not a part of that series but nevertheless a marvellous view from the capital, is a city landscape showing one of Warsaw’s gardens. It most likely presents what the painter encountered during his 1887 visit to the city. 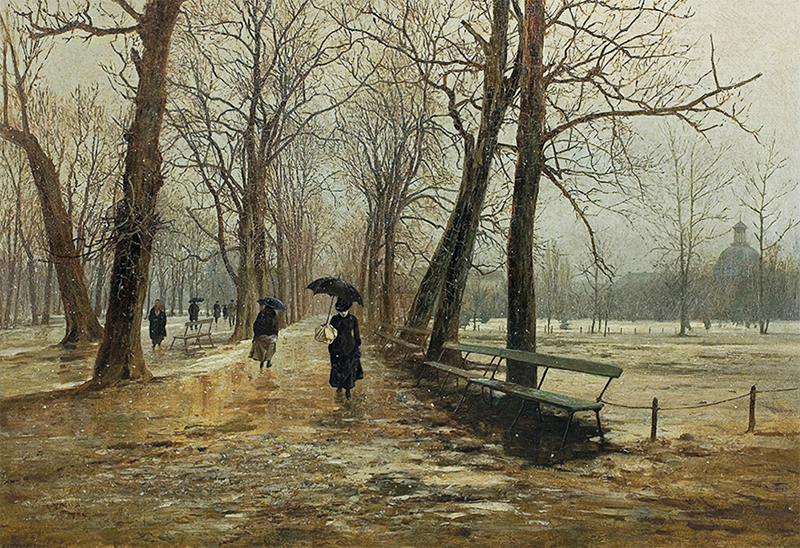 The bare trees, brownish ground and falling snowflakes are characteristic of the transition between autumn and winter in Poland. 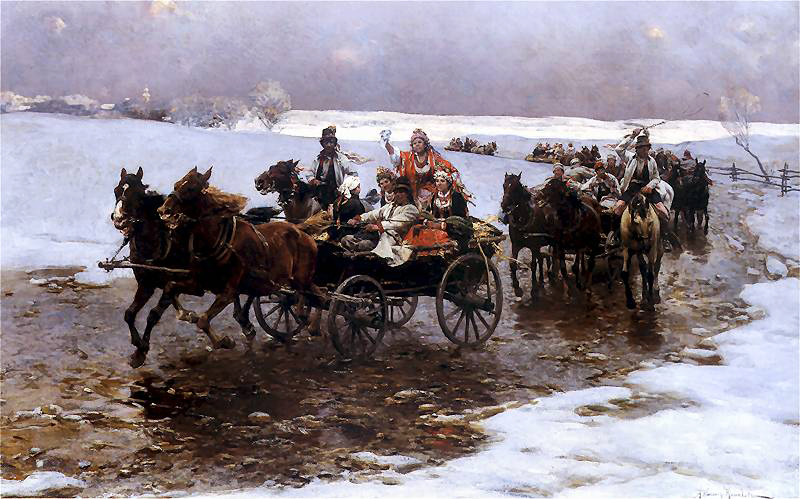 Similar conditions occur also when Poland’s coldest months end, a time that always receives a warm welcome.